In Apologia Poetica (1717) Orffyreus wrote that when his machine will be made public, people would all sing joyfully: Jesus was ressurected today! The natural last part of this "journey" will be an attempt to reverse-engineer the machinery that Orffyreus demonstrated for all those years, and make it public. The last part of my life long work in codes will be a serious attemt to build exactly what Orffyreus writes in his hidden codes. This project is for that reason called "The resurrection". 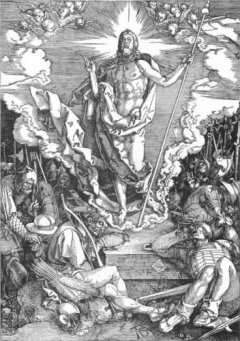 But why would Orffyreus compare "the resurrection" to his wheel? My books explains this in great detail. Besslers secret mechanism indeed has the features seen in Albrecht Durers version of the ressurection! !